BB NOTE: Cardinal Kasper is right in asking the question, though we may quarrel with the idea that our identity is in whether we are sufficiently Catholic or Protestant, but whether we are sufficiently identified with the cross of Jesus Christ. Speaking on the day that the Archbishop of Canterbury met Benedict XVI in Rome, Cardinal Walter Kasper, the president of the Pontifical Council of Christian Unity, said it was time for Anglicanism to “clarify its identity”. 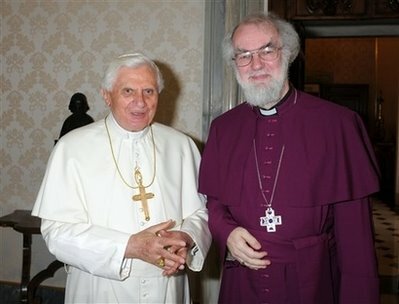 He told the Catholic Herald: “Ultimately, it is a question of the identity of the Anglican Church. Where does it belong? He said he hoped that the Lambeth conference, an event which brings the worldwide Anglican Communion together every 10 years, would be the deciding moment for Anglicanism. Cardinal Kasper, who has been asked to speak at the Lambeth Conference by the Archbishop of Canterbury, said: “We hope that certain fundamental questions will be clarified at the conference so that dialogue will be possible. This is so true. The fact is, the progressives in TEC are far more “catholic” in their worship-style, but off the rails when it comes to theology. John Paul II appears to have been the one to take such amazing strides on doctrine of salvation based on grace. The language of evangelical Protestants (mostly predominantly in the spin-offs from the mainline dominations in the United States) and the language of John Paul II found a surprising affinity. It is evangelicals that are warming up to Rome, not liberal Protestants. Now who would have thought of that? What the Cardinal may not – yet – grasp is that the fields of Protestant non-denominationalism are ripe with an open-heart to liturgy, Jesus-saving, scripturally-based, Trinitarian evangelical liturgy – which is the Anglican Book of Common Prayer. The Book of Common Prayer could do more to bring together disenfranchised evangelical Protestants – who have been refugees from their parent denomination for, as in the case of both the Virginia Baptists and the United Methodists – for centuries. 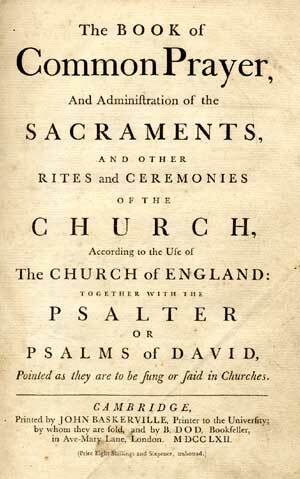 I was astonished recently when I attended a predominantly African-American Baptist wedding in Washington, D.C. and the Baptist minister was using the Book of Common Prayer for the wedding liturgy. I didn’t even have to look at the service leaflet, which caused my friends to inquire how I knew it all by heart! They thought the pastor wrote it. Something indeed is happening here, but it’s something even deeper than whether Lambeth will tilt to Rome or to New York. What is that “yoke of slavery?” Isn’t it selling ourselves to the “spirit of the age?” The walls are falling between Christians that have long had antipathy for one another because of the freedom we find when we are bonded to Jesus Christ first. It’s Jesus first, Anglican second. It’s Jesus first, Roman Catholic second. It’s Jesus first, Protestant second. When Jesus is first, we are free. That’s what means that He is the head of the church, He is first. John Paul II and now Benedict speak as those who believe, not just with their minds but in their hearts that Jesus if first. This resonates to evangelicals – whether we are Anglican or non-liturgical Protestants. Benedict’s speech to the American people was filled with the assumption that Jesus is first. The bridge over the chasm is so strong when he and other Christian leaders “get it” that we find ourselves meeting on that bridge and swapping stories like old friends. It’s such a contrast than what we find at so many General Conventions and Diocese Councils, where the heart-understanding that Jesus is first is almost considered “common.” We then are aliens in our own land, Prayer Book in hand that still speaks the language of Jesus first – but with the imagery of the word “Christ” being reimagined into something so different renders us to polarizing sides. We are divided. What appears to be before the bishops of Lambeth is whether they will embrace their love for Jesus first, that they may be filled with His Holy Spirit, that they will be converted and in that conversion repent and return to the Lord. The simplicity of the Gospel is so often lost on those of us who bear the name of Christ. If we can’t agree Who is first, how can we agree on anything else? It’s not our love for the Church, or our love for the lost, or our love for those who are excluded, or our love for our neighbors, or our love for justice, or our love for ourselves. It’s putting first things first and falling in love with Jesus. What has been extraordinary is that it appears that the language of love for Jesus is being proclaimed from Rome to Saddleback – and the bridge between the two is to find a way to pray together as a common people who bear the name of Christ. And who has that book of common prayer? This entry was posted in Anglican News, Diocese of Virginia, http://schemas.google.com/blogger/2008/kind#post, Lambeth Conference. Bookmark the permalink. I would say it is Jesus first, Catholic Church same. The question, as you stated at the beginning of your article, is a good one. It must be asked. Even if (or hopefully even though) the Anglican church is Jesus First, is it along side the Catholic/Orthodox tradition, or the Protestant tradition? Will they stop blessing gay unions, or setting up women as “bishops”?The answer may not seem like an important thing, but it’s important to the Catholic Church. And it will determine the ecumenical relationship between Catholics and Anglicans for a very long time. Wow, clicked on this for news analysis and came away uplifted and inspired…beautifully thought and written, BB. Thank you.Our parish Vestry, studying Colossians 1:15-20 at a planning retreat, came away with two priorities:1) Putting Christ in first place;2) Helping one another do item 1. It is so interesting because this seems to catalyze one of the fundamental differences between Protestants and Catholics. Cardinal Kasper is not, it seems to me, concerned with worship styles (Anglo-Catholics, high Anglicans, low Anglicans) and how they relate to the Mass. I don’t think he is just speaking to those who practice high liturgy. 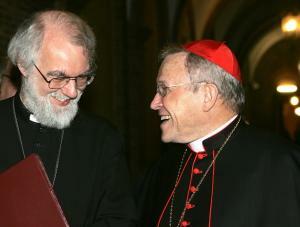 Instead, I think Cardinal Kasper is asking: “Will the Anglican Church put Christ first and, in their love for Christ, keep his commands and unite themselves to the Church founded by the Apostles.”Whether Anglicans agree with how Catholics view Apostolic Succession, Ecclesiology, and the Great Tradition, this is what Cardinal Kasper is concerned with. He is (gently) expressing the desire for the Church to be one, united together as Christ and the Father are one. BB I don’t think you understand Roman Catholics very well. I think the question is of Catholic verse Protestant is probably ask as on the Body of Christ or individual, they’d view Protestantism as rabid individualism (not high church verse low church, remember RC can out “Calvary Chapel” any Protestant in low church post-VC2 style). I’d read Cardinal Kasper as connecting the theological drift to Protestantism (remember whose talking) and asking if Lambeth will continue that drift (from their prospective the that would be very much connected). This is so important. I’m with you, babyblue. I love your emphasis on putting Jesus first and your vision of the Anglican Prayer Book gathering us back together.The issue of language is so frustrating. The progressives have changed the meaning of words, and now we find different meanings for words in communicating with the Catholics. Note that in the question, the phrase was “the churches of the first millennium – Catholic and Orthodox”. So I think it was about whether the Anglican Church will continue in an outward trajectory, away from Jesus, the New Testament and the Early Church, or seek revitalization by returning to the source.